In late spring, it creates a huge show as it is covered in intensely fragrant blooms. 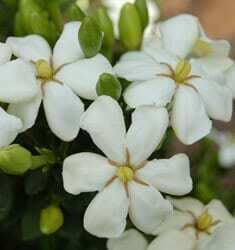 And as a wonderful repeat bloomer, you will also enjoy the fragrant, elegant blooms from late spring through summer. It has a tight, upright form so it fits into any garden and is great for containers. In fall, notice the colorfully red, yellow and orange seed pods on this exciting new variety. Very Cold Hardy to Zone 6B.